“I love making music, I love making videos … who knows how long you get to do it,” said Urban, who also thanked his fans and his actress-wife Nicole Kidman, who sat in the audience. “I’m just trying to make a connection,” he said. Urban also performed, singing his disco-flavored hit “The Fighter” with Carrie Underwood, who continued to dominate as the most awarded act in the history of the CMT Awards with 17 wins. “Thank you God for so many incredible blessings that we have in our lives … we are so grateful and we are so blessed,” said Underwood, who is married to Mike Fisher of the Nashville Predators, who are competing in the Stanley Cup Finals against the Pittsburgh Penguins (Game 5 is Thursday). Others paired up for collaborative performances throughout the night. Jason Aldean, Darius Rucker, Charles Kelley of Lady Antebellum and Derek Trucks kicked off the show with a rocking tribute to southern rocker Gregg Allman, who died last month at age 69. Peter Frampton sang outdoors with Brothers Osborne; The Chainsmokers and duo video of the year winners Florida Georgia Line performed the energetic “Last Day Alive,” which was pre-taped Tuesday; and Earth, Wind & Fire partnered with Lady Antebellum to close the awards show. The CMT Awards didn’t only include singers from other genres; Hollywood stars also attended, including Ashton Kutcher. Jada Pinkett Smith and Katherine Heigl sported pink sunglasses while Miranda Lambert sang “Pink Sunglasses” onstage. Blake Shelton, Thomas Rhett and Kelsea Ballerini also performed during the show. Little Big Town, who also sang, won group video of the year for “Better Man,” their No. 1 hit that was written by Taylor Swift. “Reba McEntire just gave me an award so that’s pretty crazy,” said the shocked 22-year-old singer. After thanking people she gave Jesus a shout-out. “I should have said that first. Sorry God,” she said. 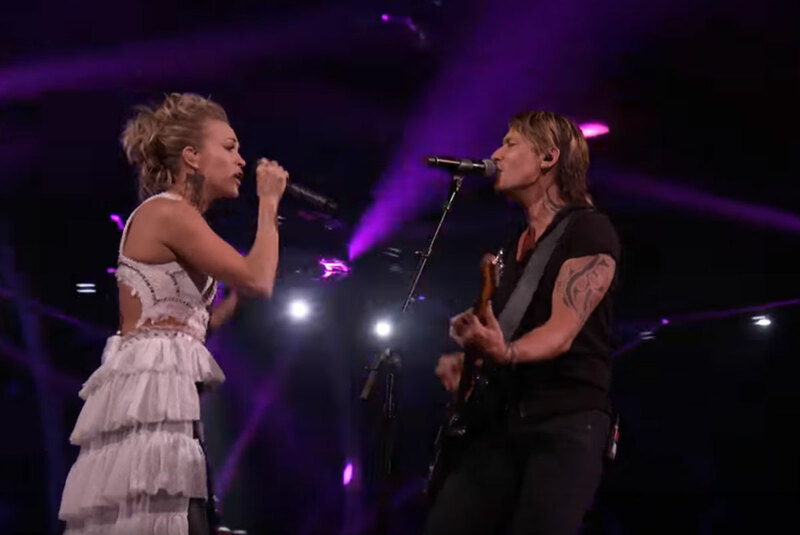 Keith Urban Wins Big at CMT Music Awards, Carrie Underwood Makes History. Go through all winners, photos, and videos of the 2017 CMT Music Awards.